We’d love your help. 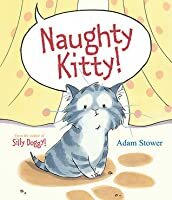 Let us know what’s wrong with this preview of Naughty Kitty by Adam Stower. Lily's mum finally agrees to buy her a new pet - but it's not a doggy, it's a kitten. When things start to go wrong around the house, Lily is quick to blame her new furry friend, but doesn't notice the much bigger and more dangerous feline that has taken up residence - a huge tiger! To ask other readers questions about Naughty Kitty, please sign up. "What do you think this place is, a zoo?" This book was sweet and a bit of fun, but not particularly heart-warming considering it's a tale about a little girl and her new kitten. I found Lily quite insensitive towards her new kitten, who doesn't even get named throughout the entire story, and more concerned with what the cat could do for her rather than enjoying the adventures of an innocent baby animal. She seemed a bit of a negative American-kid stereotype, you know, the I-want-eveything-now ki "What do you think this place is, a zoo?" This book was sweet and a bit of fun, but not particularly heart-warming considering it's a tale about a little girl and her new kitten. I found Lily quite insensitive towards her new kitten, who doesn't even get named throughout the entire story, and more concerned with what the cat could do for her rather than enjoying the adventures of an innocent baby animal. She seemed a bit of a negative American-kid stereotype, you know, the I-want-eveything-now kind of child. The secret tiger was quite amusing, but I would not have expected such wanton destruction from such a secretive and elegant animal as a tiger? But perhaps I have just been spoiled with The Tiger Who Came For Tea. Next time Lily, more compassion for your kitten, and who knows, maybe it will even stick up for you to the big bad tiger after all! This is the story of a child who should never have ever been given a pet. Love it! By the author of Silly Dog comes another winner! A little girl wants a dog but gets a kitty, around the same time a tiger escapes from the zoo. She thinks the kitty is naughty, but really the tiger is lurking around and wreaking havoc. I can't wait to use it in storytime and hear all the little ones yell out, "No! It's the tiger! I see him!" The kitty was very cute and innocent. A solid read for little ones like myself. Lily has a cat because Mom thinks a dog is too messy. The small Kitty looks great and coyly, but whenever Lily leaves the cat alone, the home ends up being a mess. Lily blames the cat for the mess. However, it turns out that the tiger that escaped the zoo is the one that causes all the chaos. It was fun to read this picture book. The story had connections to some of my childhood experience. I thought about moments where I was wrongly accused. Similar to the cat in this story, young readers woul Lily has a cat because Mom thinks a dog is too messy. The small Kitty looks great and coyly, but whenever Lily leaves the cat alone, the home ends up being a mess. Lily blames the cat for the mess. However, it turns out that the tiger that escaped the zoo is the one that causes all the chaos. It was fun to read this picture book. The story had connections to some of my childhood experience. I thought about moments where I was wrongly accused. Similar to the cat in this story, young readers would reflect on their experiences of being blamed by parents, siblings, and peers for something they did not do. In some cases, readers might be the ones accusing others for the accidents they were not involved in. Lily was too young to figure out who caused the mess. On the other hand, her mother notices what happens by the footprints and the degree of each catastrophe. In addition to the hilarious story, I like the illustrations and organization of the story. The story starts from the front endpaper to the back endpaper. The flyers for the lost tiger gave a hint on the catastrophe to come. On the back endpaper, the story of the tiger named Fluffbun gave readers new information on the tiger’s past. The tiger's innocent gaze over Lily and the kitty on the book cover would represent the story pretty well. 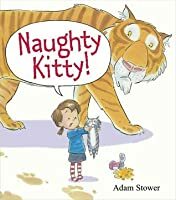 The title “Naught kitty” also warns of the tiger’s lousy behavior because tigers are the biggest members of the feline family. It would be fun to read this picture book with children to discuss responsibility and fair judgment on behaviors. Adorable illustrations and a cute read. Unfortunately, my Family Storytime session was filled with babies, so it was mostly just the parents enjoying the book. Some of the older toddlers did shout out whenever you could see the tiger's face peeping out of the bushes. This book is really cute. I think it would be fun to use in a preschool storytime about pets or silly stories. Funny with an amazing twist. Y'all didn't see my listener's face light up like fireworks when she say that, yes, there is a book 2 in this series - now she can't wait to read the NEXT book ... um... is there one?? Please? A girl’s new kitten is more trouble than she thought t would be... until we learn it’s a MUCH bigger cat causing the problems! Fun story about a little girl who wants a pet dog, but her mom says they're too much trouble and gets her a cat instead. However, a hole in the wall at the zoo has allowed a tiger to escape and when the girl mistakes the tiger for her kitty, hilarity ensues. Fun (although a bit long for a group) read-aloud book for the preschool crowd. On the inside cover of this book, we see as double-page spread of ads, mail, and newspaper clippings that inform us of a local pet shop and a striped wild animal’s escape from the zoo. On the title page, is a cat carrier with the tag reading “sold”. The story begins with little Lily bringing home her tiny gray kitten from the pet store. She plays with it and feeds itl deciding “he wasn’t any trouble at all.” When she leaves the room, an escaped tiger enters and eats eight fish sticks, all the coo On the inside cover of this book, we see as double-page spread of ads, mail, and newspaper clippings that inform us of a local pet shop and a striped wild animal’s escape from the zoo. On the title page, is a cat carrier with the tag reading “sold”. The story begins with little Lily bringing home her tiny gray kitten from the pet store. She plays with it and feeds itl deciding “he wasn’t any trouble at all.” When she leaves the room, an escaped tiger enters and eats eight fish sticks, all the cookies, plums, pickles, Mom’s pink party cake, Dad’s pork chop, the orange pop, 2 teaspoons, and a dirty sponge”. Lily’s scolds the kitten, assuming he has done all the damage. All day the tiger causes chaos and the kitten is blamed. When the mean dog next door threatens Lily and her kitten, the tiger inadvertently scares it away. Again Lily attributes this behavior to her little gray kitten. The last picture is a double page spread of all the animals that have escaped from the zoo. On the inside back cover are two news articles. One tells us that an elderly lady with thick glasses is overjoyed by the return of her long lost cat, who after thirty years has grown quite large. The other article explains the escape of all the animals in the zoo. This is a clever, fun book for children. The humorous pictures accompanied by the plot of mistaken identity are sure to draw laughs. Any child who’s been blamed for something he didn’t do will identify with the poor little kitten. The reader is sure to feel empathy for the blameless kitten. Clever use of the words “catastrophe”, “revolting”, and “cozy snuggle” will expand the child’s vocabulary. Charming and hilarious, I heartily recommend this amusing book. A follow up to Silly Doggy!, this book also features Lily and now a very large cat. From the end pages, readers will know that there is an animal loose from the zoo. Lily though is far too taken up with bringing her new kitten home. Her mother was sure that Kitty wouldn’t be any trouble at all. At first that was true, but when Lily left the kitten alone in the kitchen for just a moment, she returned to find it completely trashed. What Lily doesn’t know but the readers could see clearly was that A follow up to Silly Doggy!, this book also features Lily and now a very large cat. From the end pages, readers will know that there is an animal loose from the zoo. Lily though is far too taken up with bringing her new kitten home. Her mother was sure that Kitty wouldn’t be any trouble at all. At first that was true, but when Lily left the kitten alone in the kitchen for just a moment, she returned to find it completely trashed. What Lily doesn’t know but the readers could see clearly was that the tiger that had escaped from the zoo was the one who made the mess. The same thing happened when Lily left Kitty alone in the living room. There is even a rug that is ruined with an accident of large proportions. Happily, Lily remains completely oblivious to the tiger and in the end Kitty gets the credit rather than the blame for what the tiger has done. Stower’s humor is zingy and broad here. He doesn’t hold back on the visual jokes or on Lily’s reactions to the actually sedate little cat. Children will immediately get the humor of mistaken identity and will pay close attention to spot the tiger on the pages where Lily can’t seem to see him. The ending is completely satisfying, particularly because Lily continues to be oblivious to what is actually happening around her and readers will be surprised by a full view of the truth as well. The art tells much of the story here with the narrative almost entirely from Lily’s perspective. The tiger can be spotted right before each disaster and right afterwards too. The illustrations are energetic and filled with action and the entire book reads like a cartoon episode. Funny and a great read aloud, this book is sure to keep attention focused and kids giggling. Appropriate for ages 3-5. Genuinely I coul One. Kitty is the cutest kitten ever. Stower’s illustrations are the best. I love how he has managed to convey a confused kitty, a perplexed kitty, and a kitty looking innocent in the face of accusation. Lily wanted a dog, but her parents said they were too “messy” so she got a kitty. Lily has fun getting to know her kitty…at first. But then the kitty started being naughty. The kitty got into food, destroyed the living room, and leaving surprises around the house. However, readers know that there is something afoot. For the kitty isn’t the only kitty around and readers know just what is really happening at Lily’s house. This is a delightful book. I wondered how Adam Stower could create a feline b Lily wanted a dog, but her parents said they were too “messy” so she got a kitty. Lily has fun getting to know her kitty…at first. But then the kitty started being naughty. The kitty got into food, destroyed the living room, and leaving surprises around the house. However, readers know that there is something afoot. For the kitty isn’t the only kitty around and readers know just what is really happening at Lily’s house. This adorable book is also hilarious! Poor kitty is blamed for being a bad kitty when the reality is that it is a tiger causing all the trouble. Somehow the little girl never sees the huge tiger sneaking around and causing all the trouble. Children will delight in seeing what the little girl does not. Thankfully the tiger helps the kitty get out of trouble in the end. The illustrations make this book! As the kitty innocently goes about its day, the reader can see how the tiger is causing trouble This adorable book is also hilarious! Poor kitty is blamed for being a bad kitty when the reality is that it is a tiger causing all the trouble. Somehow the little girl never sees the huge tiger sneaking around and causing all the trouble. Children will delight in seeing what the little girl does not. Thankfully the tiger helps the kitty get out of trouble in the end. 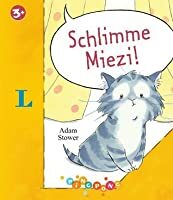 We loved this sweet book with the adorable faced kitty! Poor kitty can't do anything right in Lily's eyes. Her tiny kitty gets in quite a bit of trouble. It seems that every time Kitty turns around Lily is scolding it for something. However, it isn't Lily's kitty who is making the mischief but a huge tiger that has escaped from the zoo. We love the illustrations of Lily and her kitty. AND...my reluctant 8 year old read this book without any help which makes it even better for this reading momma! I loved, loved, loved Naughty Kitty! Lily can't believe ALL the trouble her kitty has gotten into today. But readers know something that Lily doesn't. And that is more than half the fun in this oh-so-playful read along adventure. Hint: A tiger has escaped from the zoo! The real story, of course, is communicated through the illustrations! I loved seeing the tiger sneak around on each and every page. I loved how clueless Lily was. And Kitty, as you can imagine, is quite an adorable, innocent-looki I loved, loved, loved Naughty Kitty! Lily can't believe ALL the trouble her kitty has gotten into today. But readers know something that Lily doesn't. And that is more than half the fun in this oh-so-playful read along adventure. Hint: A tiger has escaped from the zoo! The real story, of course, is communicated through the illustrations! I loved seeing the tiger sneak around on each and every page. I loved how clueless Lily was. And Kitty, as you can imagine, is quite an adorable, innocent-looking kitten. Everything about this one just worked for me!!! Mom decides to get Lily a pet that was less messy than a dog so she got her an adorable little kitty instead. Lily was skeptical, but soon Kitty grew on her. But the first time Lily turns her back after feeding Kitty, a tiger appears and eats everything in sight, then quickly hides when Lily comes back. Of course, Lily blames the monstrous mess on the innocent tiny Kitty, which will provide rolls of laughter from listeners. A very cute book about how it's easy to blame the wrong person or pet for things going wrong. Lily can't leave Kitty alone for even a minute without disaster happening. Even though it seems unlikely that a little tabby kitten could have destroyed the cake, eaten all the food in the refrigerator, or any of the other things for which she's blamed...who else could have done it? It's not like there's a Bengal tiger in the house. Or is there? The ending is interesting, and leads to a lot of interesting A very cute book about how it's easy to blame the wrong person or pet for things going wrong. A girl asks for a pet and her mother buys her a kitten. This kitten is blamed for messes all over the house even though she is innocent. Either the girl in this story is one of the most dense children ever or this is a tiger that I would want to play hide and seek with. My daughter enjoyed this book too. She kept screaming at the girl in the book saying the kitten didn't make that mess--the tiger did. Would recommend. A little girl brings home a new kitten. Unbeknownst to her (but beknownst to the audience), an escaped tiger is prowling the neighborhood. Unfortunately, every time the tiger destroys something, it looks like the kitten is to blame! The kids really enjoyed this one. It was one of those books that made them point at the pages and talk to the characters. "No, it's the tiger! It's behind you!" They approved of the happy ending. Great interactions throughout. A good storytime selection. Two year old is obsessed with this book. The poo on the rug really sealed the deal. He got a couple of advanced vocab words from it, though. Catastrophe, and revolting. I thought it was four star upon first read. Illustrations are solid. Storyline, too. Five stars because it really got into the head of my two year old. Adam completed a BA in Illustration at Norwich and an MA in Narrative Illustration at Brighton where he now lives and works. Adam is now represented by Arena agency. Adam has a passion for drawing and a great love of traditional illustration. He specialises in fiction for children, editorial, character development and product design.